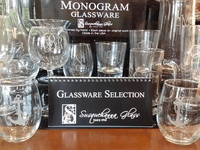 Lovely personalized glassware that would meet almost any gift need! Engraved, Etched with monograms or names, very elegant! One of the most popular names in glassware. The finest in quality. It is not just beautiful but practical and will be admired by any guest! Something for everyone!!! Beautiful glassware sold in sets of 4 for easy gift giving or entertaining.